What is the Zhou B Spirit? It is a sense of selflessness, a sense of sacrifice, and a commitment to lifting up others. Never taking “no” for an answer. Never giving up on your dreams. Always believe that everything and anything is possible, even going against the greatest of all odds. These are the things my father and uncle have been teaching me for as long as I can remember. I grew up in an artist family where my father and uncle were visual artists and my mother a professional dancer back in China. Little did I know that my entire childhood and upbringing would prepare me for the role that I’m playing today as the Executive Director of the Zhou B Art Center. It was a very unique family situation where my father was married to my mother but is also essentially married to my uncle. It is this kind of unbreakable bond and connection that makes them the Zhou Brothers: truly unique figures in the world of art. Growing up I was never interested in the arts. I loved sports and athletics, and that ruled my daily life, barring anything and everything else. But I was always surrounded by the arts, especially the Zhou Brothers art. I can remember my early years way back in China growing up in my father and uncle’s studio. The Zhou Brothers always put in the extra time and work, honing their skills and techniques when other artists at that time already have been home or out and about. I remember when I first came to America at the age of eight helping my father and uncle with their studio work, moving the giant canvases to stretch and unstretch their paintings. My childhood subconsciously prepared me for what I do today, working with the Zhou Brothers and other artists at the Zhou B Art Center on a daily basis, and navigating the art world beyond Chicago. 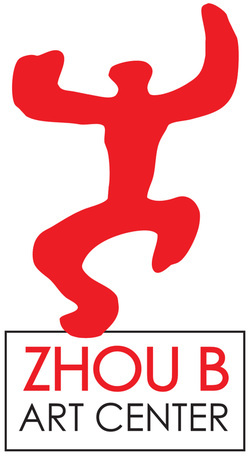 The Zhou B Spirit is a huge part of my life and my family’s life, it lives through the Zhou Brothers art and the Center, lifting up the people and artists of our diverse community. This spirit makes us who we are and makes us truly unique. It is the secret to the Center’s community and success and has special meaning as we celebrate the Zhou B Art Center ten-year anniversary. This Spirit of the Zhou Brothers will only become stronger over the coming years and will live on through the generations. It’s legacy, freedom, and dream will continue to inspire on a global scale. I’d like to thank my wife, InJung Oh, and my family for their support. I thank the entire Zhou B Team and Community for living and sharing this Spirit. We look forward to the coming generations.